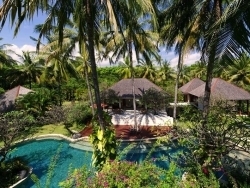 This villa is a luxury four-bedroom villa set in six acres of neatly groomed coconut grove bordering a beautiful white sandy beach and the azure blue seas of the Lombok Straits. 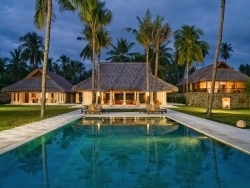 This villa is a luxury six-bedroom villa set in six acres of neatly groomed coconut grove bordering a beautiful white sandy beach and the azure blue seas of the Lombok Straits. 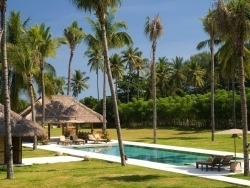 This five-bedroom villa is a masterpiece of design on the peaceful island of Lombok. Bordered by the almost deserted Sira Beach against a backdrop of soothing seas, soaring peaks and sensational sunsets. Stylish, contemporary and ultra chic this four-bedroom villa with an 18-metre infinity pool has been designed for total rest and relaxation. The four bedrooms villa is the ultimate white sand beach front villa, it offers a perfect romantic tropical retreat for families, friends and couples. 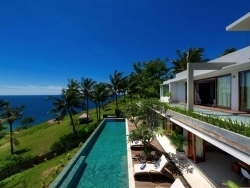 It is located on the beautiful island of Lombok, which is next to Bali.